Is your mature blog with a wealth of archived posts an underutilized asset? If those old posts are just sitting there, hoping someone stumbles across them, then the answer is yes. Here are five ways you can repurpose the content to generate sales leads, website traffic and brand recognition — all without the time and effort that goes into creating new content. The chapters (i.e., the individual blog posts) must cover different aspects of the theme. A bit of editing or introductory text must be done to make the e-book flow smoothly. Some other new content (minimal) will be needed — a cover, a table of contents, and a closing page with company information, contact information and a call to action linked to the appropriate website page. You can create as many e-books as you have separate themes to cover. E-books are ideal pieces of content to promote on social media. Make a strong effort to get the word out, and you may obtain a lot of re-shares, website traffic, and natural links from relevant websites and blogs, all of which are great for branding, lead generation and SEO. Identify your best archived posts, and resurrect them on social media by re-sharing on a structured schedule. Frequency depends on your feel of your social communities. A good rule of thumb is to share a given post 2-4 times a day, keeping the schedule rolling for 30-60 days. At that point, you can review results and see which posts are attracting attention — keep those re-shares going, drop or cut back on less popular posts, and add new ones. When selecting posts to re-share, make sure they are still relevant and accurate. If they aren’t, you may do your brand harm by promoting them. This repurposing idea, by the way, highlights why creating periodic “evergreen posts” is so important. So often bloggers get caught up in the moment that they forget about what a post can do for them months or even years down the road. Email campaigns often suffer a premature death because companies run out of content ideas or time to write copy. Repurposing old blog posts is a terrific way to keep email campaigns full of life — and results. A simple technique is to have the email display a snippet of an old post or two, with links to the posts for subscribers who want to read them in full. To make this approach work, you may have to add or update calls to action on the post, and provide links to appropriate product/service pages so subscribers can find them easily — and possibly order or inquire. Again on the theme of thinking ahead, bloggers are wise to write posts about product applications, case studies and other topics that will always be of high interest to customers and prospects that subscribe to your email. If you are fearful that subscribers will think poorly of you because you’re recycling content, worry not. First, even if subscribers read the blog post the first time, they’ve probably forgotten. Second, even if they do recall reading it, they may well conclude you are as efficient managing your assets as you are overseeing their account. For your very best archived posts, a link building campaign can be very effective. If the posts are well researched and/or look at important issues from a fresh perspective, publishers in your niche will be interested in sharing them with their audiences. For outreach to be effective, you must understand what type of content a given publisher focuses on and the needs of their audience. A personalized email that explains what the post is about, why the publisher’s audience may be interested and a simple request to link to it is all that is necessary. If you’ve been blogging for some time and/or have an active SEO campaign, chances are you already have relationships with off-site publishers, making this an easy option to dive into. Your sales team (or you, if you’re doing the selling) is always struggling to build credibility and expertise. Showcasing great blog posts to prospects is a terrific way to do it, and it doesn’t matter whether the posts are a day old or five years old if the content is relevant and useful. Salespeople can work snippets and post links into structured follow-up emails, or hand pick them to send to important prospects where the content is extremely relevant. In larger organizations, sales personnel are not always aware of the wealth of content in the company blog archive — make sure this doesn’t happen in your business. In addition to using individual posts for sales follow-up, those e-books you created (see the first suggestion) also make excellent giveaway items to prospects. Even if prospects don’t read the entire e-book, they will be impressed that you were able to create such a thing! Sometimes this impression alone is enough to turn a cool prospect into the hottest of leads. Of course, all of these suggestions work only if the blog posts are of high quality. This is so important! 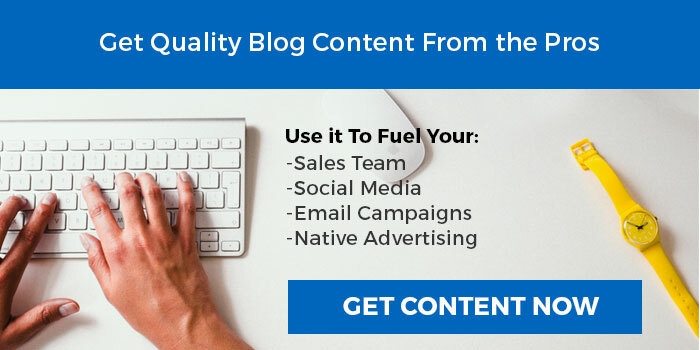 Not only will your brand stand or fall on the strength of your blog posts, but also your content quality will have an impact on SEO. Google crawlers are getting better and better at assessing qualitative factors in their ranking algorithm. If Google sees your blog post as being useful, relevant, engaging, informative and credible, the backlinks and website traffic you create through all of these five techniques will amplify in value. Brad Shorr is Director of Content Strategy at Straight North, a leading Internet marketing agency in Chicago that offers SEO, PPC and web design services. With more than 25 years of sales and marketing experience, Brad has been featured in leading online publications including Smashing Magazine, Entrepreneur and Forbes.